WIN-911, the leading alarm notification software in the automation industry, announces major updates to smartphone and tablet apps for Apple (iOS) and Android devices. New notification sound selections are provided, allowing users to assign unique ringtones to the Mobile-911 app. In-app sounds will provide better alerts in noisy environments, and enable better response times to active alarm events — even when the app is open. iOS users can select a notification sound from a variety of newly added ringtones. Several of these tones were selected to be louder and longer than the standard iOS default. Android users are still free to select a custom tone from their device. "When a piece of equipment malfunctions, users need to know immediately what happened, where it happened, and what went wrong," said WIN-911 CEO Greg Jackson. "WIN-911 is providing the products and technologies that improve reaction and response times of field personnel. The faster, more convenient, and more secure we can make communication between SCADA systems and controllers, the more productive and efficient our clients can be." The updated apps provide simplified configuration and customization options. Users are now able to change the appearance of their alarm display screen by adjusting font sizes, making alarm notifications more visible and easier to read. Bulk deletion options have been added to save time and streamline use. Text scaling is improved on tablets and other devices with larger screens, enabling users to view alarms and reports while on the go. Mobile 911 provides secure, reliable, and intuitive alarm notification management to improve response times and operational efficiency. Smartphone and tablet apps, coupled with our next generation Mobile 911 server, provide secure messaging with the reliability of the industry's leading remote notification software. WIN-911 is the most widely-used alarm notification software in the world protecting 10,000 facilities in 70 countries and six continents, including hundreds of Fortune 500 and Global 500 companies. WIN-911 delivers machine alarms and other key data via any conceivable method (e.g. smartphones, voice, SMS, web browser, announcement systems, etc.) 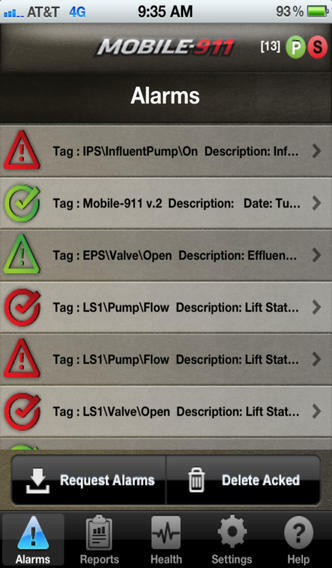 and provides a logic engine to decide who should receive critical alarms, and how notifications escalate. The company is headquartered in Austin, Texas, USA, with offices in Grenoble, France and a network of authorized distributors and system integrators in 50 states and throughout the world. Visit the website at: www.WIN911.com. 0 comments on "WIN-911 Alarm Notification Improves Response Times via Mobile 911 Upgrades"